I recently read this book, which was a tip from a trusted source – my entrepreneurship professors at the University of Oslo. 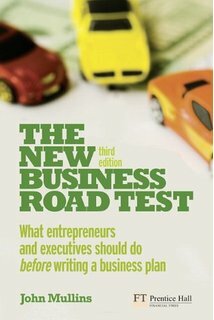 The new business road test (John Mullins, 2010, third edition, 315 pages) is, in short, a great book. What makes this a special book in the entrepreneurship arena, in my eyes, is that its focus is centered on the right spot: analyzing business opportunities, instead of analyzing entrepreneurs (to where our common sense typically points us to – “look how great Steve Jobs was”, or “how on earth these people managed to create such a great company”, etc). So, the book goes on describing how market (those who buy) and industry (those who sell) must be assessed in their micro and macro perspective, before one can think about jumping in a new idea. In addition, the entrepreneurial team must also be judged in terms of their members’ goals, competencies and networking, to guarantee that they have what it takes to succeed. To conclude, I must reaffirm that this is a great book. I hope to get back to it in the future again, especially if and when I get to a business idea that I am very convinced will work.